The sole of the foot is ridged and pitted; this contributes to the sure- footedness of the elephant for a large variety of terrain. An elephants five toes are buried inside the flesh of the foot. Not all toes have toenails. The circumference of the forefoot is approximately equal to half the the shoulder height! The elephant´s foot size is used to judge the overall size of a particular animal, its age, and the number of elephants in a particular group. Its feet play a role in creating holes in which water can collect, for digging up roots from the ground, and for navigating difficult terrain. Similar to human fingerprints, the pattern of ridges and fissures left behind by the sole of an elephant is actually quite distinctive. In fact it is possible to judge the age of an elephant by its design. Generally, younger elephants have crisp designs, and older elephants have smoother ridges and worn heels. 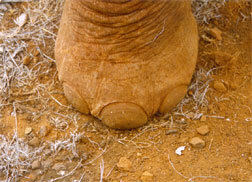 The only evidence of an elephants five toes buried within the flesh of the foot are the toe nails. Actually, the toe nails are cornified shields in the skin and are not attached to the fingers/digits. Interestingly, not all of the toes have nails either. Overall, it is generally accepted that the African elephant has four toenails on the front feet and three on the back as opposed to the Asian elephants which have five on on the front and four on the back. It is important to note that there has been some disagreement among particular experts and there appears to be a possible range within each species for the number of toenails. For example, it is plausible that a particular group of African elephants may have the same number of toenails on the front and back as the Asian. The fore foot of an elephant has a circular shaped outline and the back foot takes more of an oval shape. However, "elongated oval footprints footprints usually indicate an adult male" (D. Chadwick). Bulls typically leave a double print because the rear leg often falls slightly to the side of the front leg. Interestingly, cows (female elephants) typically have rounder pads and step more precisely in the same spot with both legs (D. Chadwick). The foot becomes more narrow above the sole. A great proportion of the foot is composed of fibrous, fatty tissue. The tissue--acting as a shock absorber-- has elastic properties which help the elephant maintain its grip on the ground and move silently. The reason that elephants can walk so quietly is in part due to the "elastic spongy cushion" on the bottom of the foot smothering any objects beneath itself. This causes most noises (including the cracking of sticks) to be muffled. Interestingly, the structure of the foot allows an elephant to walk in deep mud without difficulty, because when it is being withdrawn the circumference becomes smaller which in turn reduces the suction (C. Spinage).